I don’t know why Magdelaine Mazeres left France for America. She arrived in the late 1870s, a single woman, navigating the bustling city of San Francisco alone. She ended up in a bad situation. Would she survive the challenges ahead of her as a single parent alone in the city? Let’s find out. Here is her story. What Was Magdelaine Doing in America? Magdelaine’s story is a bit unusual. Normally, a male relative emigrated first. He got himself settled, earned some money, then sent for his siblings or parents…usually one by one. But, the daughter of Jean Mazeres dit Salanave and Marie Anne Lacrouts came first. At least, that’s how it seems. We don’t have her immigration records, so we don’t know who might have migrated with her. We can rule out siblings and parents as they all stayed back in France. The 1920 US Federal Census states that she arrived in 1877, so we’ll take the enumerator’s word for it until better information surfaces. She wasn’t entirely alone. There were other people from Ogeu les bains living in the San Francisco region. Members of the Lassalle-Maiste and Lounibos families had come a couple of years before Magdelaine. They lived in San Francisco and El Verano Valley (North of San Francisco) where they built their winery. I am sure there were others. Why did Magdelaine migrate? Perhaps she came to work. Maybe she arranged a situation before she left France. She might have been offered employment from someone who moved to America. Whatever the reason, she was living in San Francisco in the late 1870s when she met Louis Lacazette. There was a thriving French community in France in 1880. It was a vibrant community that kept its ties to the old country. There were fraternal organizations and aid societies. Early San Francisco newspapers were filled with their activities. Louis Lacazette was also from France. He arrived sometime around 1874. I don’t believe it was long after Louis and Magdelaine met that they began courting. Both being from France, they may have met through the French community outings. Perhaps they found some common ground both being from the same country. They were married in San Francisco around 1880. The young couple started their family soon after marriage. A daughter was born in 1881. This would be their only child. In 1884, Magdelaine went before the court in San Francisco to file for divorce. Grounds: desertion. Louis had left her for another woman. He left her alone in San Francisco with a baby. This 20 year old woman did what she needed to. She wrote home and she found work. Instead of going back to France, to cry on her mother’s shoulder, her brothers came to America to support her. 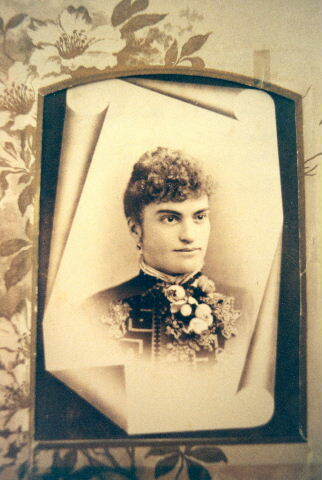 Charles arrived in February of 1885, and her brother, Antoine, arrived soon after. This was about five months after she filed for divorce. Through letters we know that the three siblings lived together at first. The brothers found work. They found San Francisco a tough city to start a new life in. But, they worked hard and hoped that better times were around the corner. Magdelaine’s divorce was finalized around 1887. She remarried to a man with the last name of Cabonot. It appears that this marriage did not last long. I don’t know whether Magdelaine went back to live with her brothers after this marriage. I picked up her trail in 1892. She was living at 1613 Stockton Street. Magdelaine was employed as an ironer for Mrs. Simonie Bodors. No doubt Mrs. Bodors ran a French laundry which was common employment for my French. My ancestors and cousins were involved in several of them. Magdelaine’s brother, Charles, was trying to get into the business himself. Her daughter, Maria Louisa, was now 11 years old. Sometime at the turn of the century Magdelaine’s situation improve greatly. She met a successful man name, Romain Menaud. Romain was from the same region of France as Magdelaine. He arrived in California around 1871 and lived in Millertown in Fresno County. By 1872, he was running his own sheep business. Romain married a woman named Ambrosine. They had two children. The couple divorced in 1896. By 1900, he was the owner of the Old French Hotel at Fresno and G Streets. I do not know how Romain and Magdelaine met. Fresno would have been quite a distance from San Francisco. Today, it takes almost three hours by car and about 60 hours on foot, according to Google Maps. I would think it would have taken more than a day by the transportation of 1900. It doesn’t seem an ironer in a laundry in San Francisco and a businessman from Fresno would cross paths. The couple was issued a marriage license on the 3rd of January 1900. They married soon after. Magdelaine was 37, though her age given here is 41. Magdelaine moved to Fresno with the man who listed himself as a Capitalist in the 1900 US Federal. Census. Magdelaine lived out the rest of her life in Fresno. Fresno must have seemed a world away from the hustle and bustle of San Francisco. It was more rural. More farm animals than people. In 1920, she was living on a farm in what was known as the Washington Colony in Fresno. She died 3 years later at the age of 60. Romain died 2 years later. They had no children together. I can’t imagine what it must have been like for Magdelaine to find herself abandoned in a city like San Francisco. Men outnumbered women considerably. It had the nickname the Wickedest City in America until the 1920s. A woman alone in San Francisco, deserted by her husband, probably didn’t have a good change of surviving. Not only did she have a baby to take care of, but she had the scorn of Victorian society that look down upon divorcees. She must have been an incredibly strong person to persevere. I got a bit behind on the 52 Ancestors in 52 Weeks series due to internet connectivity issues and procrastination. Since Magdelaine’s story fits the Strong Women, Lucky, and Misfortune categories, this post will represent all three.